Join Brandon Thomas Author and Host of The Painting With Magic Show at Natural Bridge for a relaxing time painting in the beautiful country side of Kentucky. Because this seminar will be in October you will see the beautiful autumn colors of Kentucky. So bring your camera! 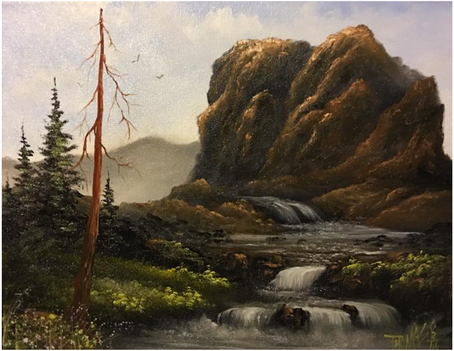 Not only will this seminar be in beautiful scenery but you will Learn advanced painting techniques . . In the seascape workshop you will learn advanced seascape techniques. As in advanced foam techniques, advanced wave form, advanced sky layering and much more. 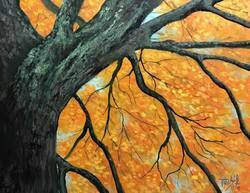 Brandon Thomas workshops are hands on and you will leave with a finished painting. Brandon Thomas workshops don't happen vary often so this is a great opportunity to take your paintings to the next level with Brandon Thomas. Each workshop will have a meet and greet, where you can chat with other artist, ask Brandon questions and make new life long friends. Not only will you be learning advanced techniques, but you will be surrounded with the beautiful autumn Kentucky scenery. This is a special place to Brandon, because he spent many summers here as a kid fishing, hiking and many family reunions. See the vary place that inspires many of Brandon's paintings . And only a few miles down from Natural Bridge is the little small town Brandon grew up in. Jackson, KY and visit the area for more inspiration and get to know the area that Brandon grew up in. This is more than a seminar this is your chance to meet new people and to learn a new life long skill you have always dreamed of! 1- tabletop easel - 1 - Brandon Thomas brush set you can purchase at the workshop for 50% off! Natural Bridge is composed of what is known in geological terms as Pottsville conglomeratic sandstone. Large blocks of stone falling off either side of a narrow sandstone ridge caused the first opening that began the transformation of the sandstone outcropping into an archway. The weathering process, along with the root systems of plants, continued to develop the unique archway that makes up Natural Bridge. The natural beauty of the area and the great sandstone archway had potential for commercial development. In 1889 the Kentucky Union Railway established a rail line through the town of Slade to connect with some of the Commonwealth’s most extensive timber resources. Railroad executives also sensed the potential for visitors to come to the area to witness the spectacular beauty of the land. The railroad acquired the land around Natural Bridge and began to build trails and campgrounds. The Louisville & Nashville Railroad later acquired the property and in 1926, donated the lands around Natural Bridge to the state park system, becoming one of the four original state parks. In 1927 Hemlock Lodge was added to the new park, providing comfortable guest accommodations. It burned in the early 1960s. A new lodge, built in 1962, is located on a dramatic ledge overlooking a deep valley. The park has 2,400 acres and is basically surrounded by the Daniel Boone National Forest. There are over 18 miles of hiking trails to Natural Bridge. The park also includes a four-acre pond with one-acre Hoedown Island in the middle of it. The Island is the scene of folk dancing and is a popular part of the park. Also, 40-acre Mill Creek Lake is an excellent place for fishing for bass, bream, catfish, crappie, and rainbow trout. Or, you can bring your canoe and paddle while witnessing the splendid beauty of the rock formations. For a more relaxing climb to natural bridge, enjoy a ride on the sky lift. The ascent begins one-half mile from the park entrance and ends within 600 feet of Natural Bridge. Open daily first weekend of April through the last weekend in October.